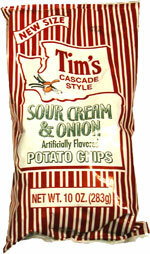 Taste test: I was a little hesitant at first, as I love Tim's chips and thought that maybe this flavor wouldn't be that good. The crunch of the chip makes up for the lack of flavor — I prefer the flavor on Tim's Jalapeno and steak flavors much better. Still, these are great potato chips, and the taste of the flavoring is more on the onion side than on the sour cream side. If you like thick and crunchy chips, and don't mind the extra onion flavor, then grab a bag of these. Smell test: Kind of an oily smell, what we expected, though, as these are kettle-style chips.